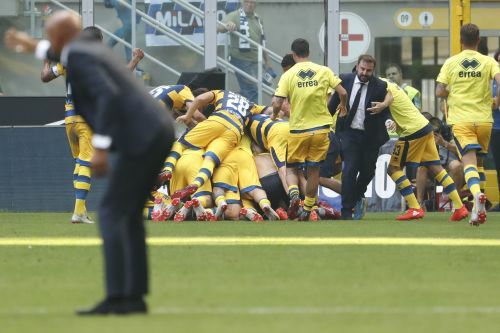 MILAN (AP) — Just three years after going bankrupt, Parma upset Inter Milan 1-0 at San Siro in Serie A on Saturday. "It's an indescribable feeling," said Dimarco, who celebrated wildly after scoring his first Serie A goal. "I still can't grasp myself what I did ... I just saw it go in and celebrated like crazy. It felt like watching a replay to me, the ball took forever to reach the net. I'm happy, it's a very important win because we hadn't won yet this season. It's a win that gives us energy. He added: "You never forget your first goal in Serie A. I'm enjoying the moment but I mustn't have too much joy because you go up quickly and you come back down quickly." The Nerazzurri host Tottenham on Tuesday in their first match in Europe's elite club competition in more than six years. With that game in mind, Inter coach Luciano Spalletti rested Mauro Icardi, Matteo Politano, and Kwadwo Asamoah, although all three came on in the second half. Dimarco was sent on by Parma coach Roberto D'Aversa at the start of the second half and was almost the villain of the match as he appeared to handle the ball when clearing off the line against Ivan Perisic, but the referee waved play on. The 20-year-old left back proved to be the hero 11 minutes from time with a stunning shot from 30 yards into the top right corner. "I didn't see Dimarco's shot coming because there was a player in front of me who was offside," Inter goalkeeper Samir Handanovic said. "He scored a great goal but I don't think it was within the rules. At Inter we don't look for alibis but their goal shouldn't have stood and there was a clear-cut penalty for us which they pretended nothing happened." Dimarco, who is an Inter fan himself, has faced a barrage of insults on social media and has pleaded with the Nerazzurri fans to halt the abuse. "The celebration was the freedom from these past few difficult years. I would never have wanted to score this first goal against the team I adore, but that's football. I'm sorry for the fans who felt offended, but it's not like that. I want to ask you to not insult me ..."
When the two sides last met, Napoli lost 3-0 — a week after beating Juventus in Turin — and effectively handed the title to the Bianconeri. Sampdoria routed newly promoted Frosinone 5-0, including two by Gregoire Defrel. Frosinone has yet to score in Serie A.